In November last year, I met the dynamic Karthikeyan Srinivasan, Chief Naturalist of Jungle Lodges and Resorts in the 1st Goa Bird Festival. Being part of the organising section of the festival I happened to interact with Karthikeyan under the shades of lush mangroves in Chorao Islands and discussed what I know best "ants". Conversation meandered towards JLR's blogs, stories and while at it, Karthikeyan suggested I do an article on "Ants of Karnataka". After much prodding and delay, I finally managed to write a two piece article on "Common Ants of Karnataka". The links are below. Do read! 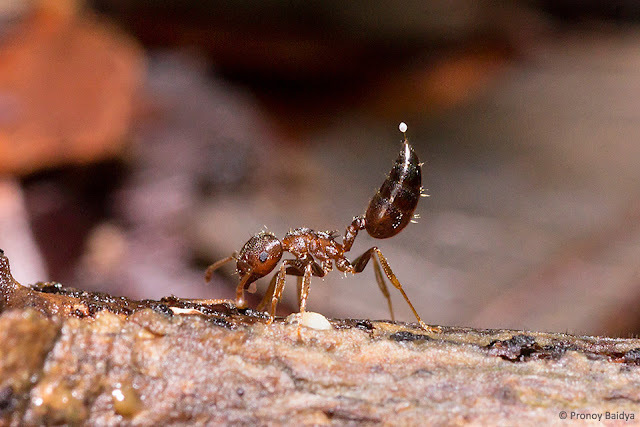 Over the past year, I have been inconsistent in sharing my ant adventures, most of which have been very interesting. I hope to keep updating my blog regularly from now on with smaller informative pieces rather than a big post.